America’s nuclear arsenal depends on a surprising relic of the 1970s that few of us may recall: the humble floppy disk. It’s hard to believe these magnetic, 8-inch data storage devices are what’s propping up the most fearsome weapons humanity has ever created. But the Department of Defense is still relying on this technology to coordinate key strategic forces such as nuclear bombers and intercontinental ballistic missiles, according to a new government report. The floppy disks help run what’s known as the Strategic Automated Command and Control System, an important communications network that the Pentagon uses to issue launch orders to commanders and to share intelligence. And in order to use the floppy disks, the military must also maintain a collection of IBM Series/1 computers that to most people would look more at home in a museum than in a missile silo. This isn’t the first time we’ve heard about the military’s reliance on seemingly archaic tech: back in 2014, U.S. nuclear warriors showed CBS’s “60 Minutes” one of the top-secret floppy disks that helps it store and transmit sensitive information across dozens of communications sites. So to hear from the Government Accountability Office that the Pentagon has still not phased out the technology — and doesn’t plan to until the end of fiscal year 2017 — is remarkable. Still, there is a major reason — other than simply being behind the times — for the military's continued use of floppies: Sometimes, it says, low-tech is safer tech. That may come as a surprise at a time when digital technologies have almost completely superseded analog ones — heck, some companies literally give away USB flash drives these days because they’re so cheap. It highlights the yawning gulf between consumers and government. President Obama has highlighted that as a problem he wants to solve. The White House has pushed strongly to use technology more widely in government. From opening up stores of public data to creating a whole website for Internet petitions, President Obama has tried to make government more tech-savvy. And yet it’s still not enough. Speaking at the South By Southwest Interactive festival in Austin earlier this year — marking another first for the White House — Obama’s pitch to geeks and coders was simple: Join us. “The reason I'm here is really to recruit all of you,” he said. Data from Carnegie Mellon University and the Massachusetts Institute of Technology show how difficult it is for government to attract top tech talent. In 2015, only 1.1 percent of MIT graduates took jobs in government. Of that year’s graduates at Carnegie Mellon, only a handful took jobs at government agencies — and all of those were abroad, in places such as Singapore and South Korea. Colleges and universities are also coming up short in terms of training America’s next generation of digital warfighters. Information security training is not required at any of the nation’s top-10 computer science programs. The sluggish talent pipeline doesn’t make the Pentagon’s task of tripling the U.S. Cyber Command’s workforce any easier, either. The military’s investments in cybersecurity illustrate how some parts of the Department of Defense have made deep commitments to technology, even as other parts, such as America’s nuclear forces, have lagged behind. The U.S. Navy and Air Force are both highly interested in autonomous drones. Unmanned vehicles have the potential to lurk quietly underwater and survey the enemy, or to supplement human pilots in the air. But high-profile examples have also arisen showing how the military can regard technology too optimistically, revealing some of the risks of embracing it. For example, the F-35 Joint Strike Fighter was envisioned as a flexible, all-purpose craft that could suitably serve every branch of the U.S. military. Instead, it’s become a costly, time-consuming experiment that — according to multiple reports over the years — doesn’t even work. Its parts wear out before they’re supposed to. It can’t defeat older planes in dogfights. It’s vulnerable to hacking. And that’s before the fighter has ever encountered any real enemies. There are parallels here to fiction, which can be just as instructive. In the 2004 hit TV series “Battlestar Galactica,” humanity comes under assault from robots that it created. Much of the human space fleet is taken by surprise, crippled by a robot-built computer virus that spreads from ship to ship thanks to the sophisticated networks linking the crafts together. The Galactica, an obsolete warship due to be mothballed, is one of the few to survive the initial surprise attack. Why? Because the Galactica’s systems were not part of the humans’ IT network, sparing it from the virus that disables the rest of the fleet. The lesson seems clear: Sometimes, newer is not better. The Pentagon aims to install upgrades to its systems over the next year. And there are good reasons — even seemingly obvious ones — for doing so. But just as upgrading your laptop’s operating system on the first day can come with unexpected bugs, our nuclear commanders appear to take a similar caution to embracing the latest and greatest. Perhaps that’s for the best. Part of the intelligence service's work involves spying on Islamist groups. In November jihadist bombings and shootings in Paris, claimed by the Islamic State (IS) group, killed 130 people. In January 2015 jihadists in Paris killed 17 people in attacks on the satirical magazine Charlie Hebdo, a policewoman and a Jewish supermarket. 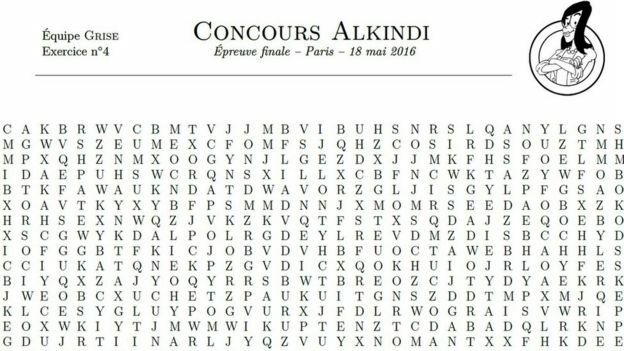 wo associations of mathematicians - France-IOI and Animath - organised the cryptography tests for school pupils. The competition was called Alkindi, after a celebrated 9th-Century Muslim Arab mathematician and philosopher, Abu Yusuf Yaqub Ibn Ishaq al-Kindi. 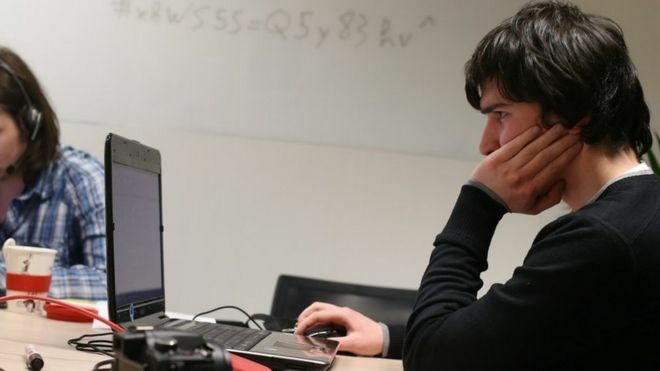 There were four rounds of tests on the internet, of increasing difficulty. The final was held at the Army Museum in Paris and the prizes included smart phones and computers. Another test example: what does the strange code mean? The DGSE's role was to provide some help and funding for it, its spokesman told the BBC. "It was a way for us to spread awareness about the DGSE's technical skills," he said. "The aim wasn't to recruit youngsters but rather to inform, especially those pupils interested in maths, so that they can see the sort of work that the DGSE does." It was also "a way for us to spread a culture of intelligence in France", he said, arguing that it was "a contribution to developing citizenship". The official declined to be named. But, in a separate statement, the intelligence service said it was also "seeking to remind people that the DGSE is trying to recruit young people skilled in information technology and maths and that it offers many professional opportunities in those areas". It is the French equivalent of the UK's MI6 and the American CIA. 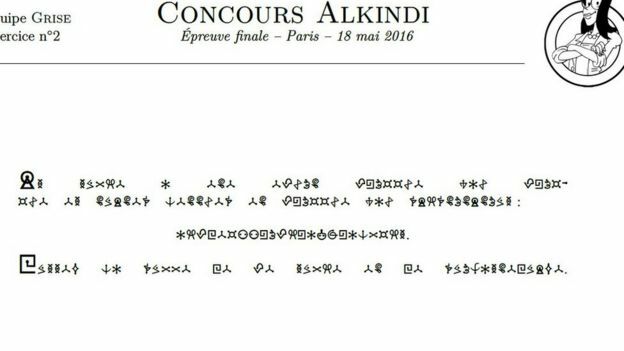 Nearly all the French regional education authorities got involved in the competition. The organisers said boys and girls competed in almost equal numbers. Schools in the Paris region, Lille, Nantes and French overseas lycees (high schools) were the biggest participants. 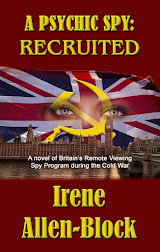 In recent years British spy agency GCHQ has also set cryptographic challenges for the general public on the internet. One involved a Christmas card brainteaser. Other tests involved cyber security battles, which GCHQ said could attract new recruits to the spy service. Vigils have been held in Cairo for the victims of EgyptAir flight 804 as a French navy ship headed to join the deep-sea search in the Mediterranean for the main wreckage and flight recorders. France’s BEA air crash investigation agency said the naval survey vessel Laplace had left Corsica and was heading towards the search zone north of the Egyptian port of Alexandria. A week after the Airbus A320 crashed carrying 66 people, investigators still have no clear picture of its final moments, with only scattered floating wreckage and some human remains found. Search teams are working against the clock to find the two flight recorders that would offer vital clues on the fate of flight 804. Acoustic signals that help pinpoint the boxes in deep water stop after about 30 days. On Friday, reports quoting Egypt’s lead investigator, Ayman al-Moqadem, via the state newspaper al-Ahram said a radio signal had been received from an emergency locator transmitter (ELT) usually situated in the rear of the aircraft, potentially helping to narrow the search area. The transmitter, known as an ELT, sends out a transmission that can be picked up by satellites in the international search-and-rescue network when an aircraft is in an accident. It is separate from the underwater locator beacons (ULB) or “pingers” attached to the flight recorders, which send out acoustic rather than radio signals and are designed to be more easily detected underwater. Doubts have been cast on whether an ELT on flight 804 could have survived or sent signals from underwater. John Cox, a former A320 pilot and chief executive of Washington-based Safety Operating Systems, expressed caution about the reported signal from the sunken wreckage. “There is a low likelihood the ELT would survive, and radio doesn’t work as well as acoustic signals underwater,” he said. Authorities from countries involved in the search have previously made conflicting statements on the plane’s fate. Greek authorities said the plane made sudden swerves as it plummeted but the Egyptians denied this; while one Egyptian forensics official’s statement that the condition of human remains suggested a bomb was later dismissed by a more senior official as “completely false” and based on “mere assumption”. France’s BEA, which is working as part of the Egyptian-led investigation into the crash, said two of its investigators were on board the Laplace, which was carrying equipment from Alseamar, a firm specialising in searching for marine wrecks. Negotiations were under way to contract a second firm to search more than one area, French and Egyptian officials said. Alseamar’s equipment includes three of its Detector-6000 systems, designed to pick up pinger signals over distances of up to 5km (three miles), according to the company. 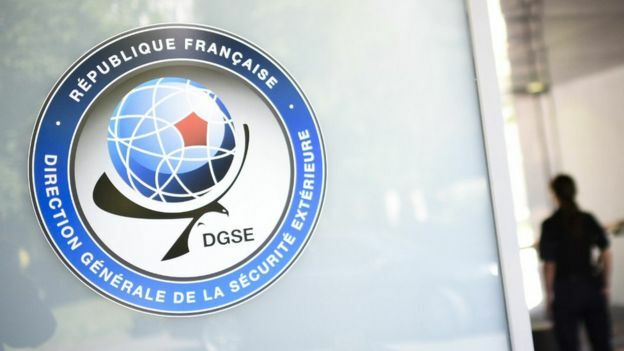 The second firm likely to be involved is Mauritius-based Deep Ocean Search, with which France and Egypt are finalising a contract, according to French diplomatic sources. The EgyptAir black boxes are believed to be lying about 3km (1.9 miles) down, on the edge of the usual range for picking up signals emitted by the boxes. Maritime search experts said this meant acoustic hydrophones would usually be towed in the water at depths of up to 2km in order to have the best chance of hearing the signals. Moqadem, Egypt’s head of air accident investigations, said the investigating team had received radar imagery and audio recordings from Greece detailing the flight trajectory of the doomed plane and the last conversation between its pilot and Greek air traffic control. It was expecting France to hand over radar imagery and other data covering the plane’s time in French airspace and on the ground in Paris, he added. Sources in the investigation committee have said the EgyptAir jet did not show technical problems before taking off from Paris. During flight, its maintenance system sent signals that at first showed the engines were functioning but then detected smoke in the cabin and an issue with the co-pilot’s window. The plane kept transmitting messages for the next three minutes before vanishing. With no flight recorders to check and only fragmentary data from a handful of fault messages, including two smoke alarms, sent by the planes Acars system, investigators are also looking to debris and body parts for clues. Cox said the fault messages collectively pointed to a possible problem in the avionics bay under the cockpit, but stressed it was too early to rule any cause in or out. Airbus, the maker of the plane, has previously said in a statement that the limited data available from the Acars messages “does not allow to establish the sequence of events that would explain the accident”. Moqadem said no bodies had been recovered so far, with search teams able to locate only small body parts. DNA tests were under way to identify the remains. He said a report would be issued by the investigating team one month from the date of the crash. EgyptAir pilot told colleagues he was READY TO DIE; Brother calls him a MARTYR! 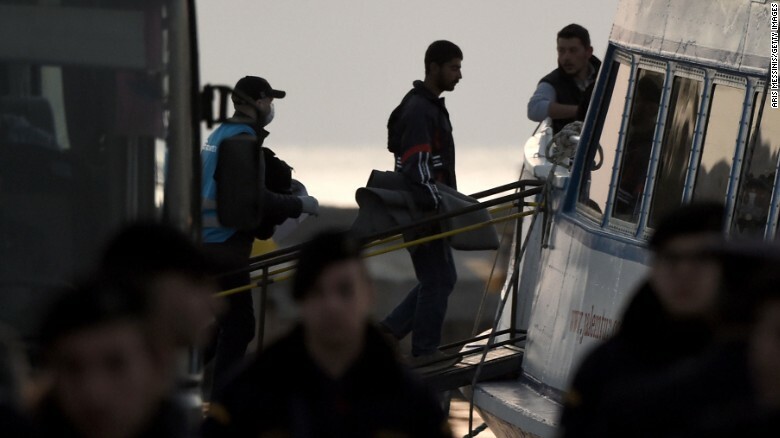 Investigators are trying to unravel why the plane went down into the Mediterranean Sea. Is it terrorism? Is it a Muslim suicide pilot? We don’t know for sure yet, but the Muslim pilot of EgyptAir flight 804, Mohamed Said Shakeer, is looking very suspicious! The pilot’s own brother told El Watan News that Shakeer called him before the flight and asked him to pray for him. Not only that, but his brother is calling him a martyr for Islam. We won’t know for sure what happened until they find the black box. But based on this, it’s very possible that the pilot committed his own Muslim jihad and took the plane down himself. After all, we know the plane was ‘swerving’ before it hit the ocean, which could represent a struggle between the pilot and the co-pilot. A new message purporting to come from the spokesman of Islamic State of Iraq and Levant calls on followers to launch attacks on the United States and Europe during the Islamic holy month of Ramadan, which begins in early June. The authenticity of the audio clip, purporting to be from Abu Muhammad al-Adnani and distributed on Saturday by Twitter accounts that usually publish ISIL statements, could not be verified. “The smallest action you do in their heartland is better and more enduring to us than what you would if you were with us. If one of you hoped to reach the ISIL, we wish we were in your place to punish the Crusaders day and night,” Adnani said. A U.S.-led coalition, which also includes European and Arab countries, launched a campaign of air strikes against ISIL in Iraq and Syria in 2014 after the militants seized vast swathes of territory in those countries. The Supreme Court of Chile will request that the United States extradites three individuals, including an American former professional assassin, who are implicated in the kidnapping, torture and murder of a United Nations diplomat. Carmelo Soria was a Spanish diplomat with dual Chilean nationality, who in the early 1970s was employed in the United Nations Economic Commission for Latin America and the Caribbean. In 1971, when the leftist Popular Unity party won Chile’s elections and became the nation’s governing coalition, Soria became an advisor to the country’s Marxist President, Salvador Allende. After the 1973 violent military coup, which killed Allende and overthrew his government, Soria used his diplomatic status to extend political asylum to a number of pro-Allende activists who were being hunted down by the new rightwing government of General August Pinochet. Soria’s activities made him a target of the Dirección de Inteligencia Nacional (DINA), Chile’s domestic security service, which was a leading implementer of Operation CONDOR, a widespread anti-communist program that began in 1968 with the participation of most Latin American governments. CONDOR, which ended in 1989, included psychological operations, kidnappings and assassinations that targeted leftwing organizations and activists. On July 14, 1976, Soria, who had by then resumed his previous UN post, was kidnapped by agents of the DINA. He was tortured and murdered under detention. His body was found on July 16 inside a car that had been dumped in a river in Santiago de Chile. The Pinochet government refused to investigate the incident, saying that Soria had been driving under the influence of alcohol. On Tuesday, however, after an investigation that dates back to 1991, the Supreme Court of Chile said that an extradition request will be sent to the United States for three individuals who were allegedly directly implicated in the murder of Soria. They are: Michael Townley, a US citizen; Armando Fernandez Larios, of Chile; and Cuban Virgilio Pablo Paz Romero, all of whom were agents of DINA at the time of Soria’s murder. Townley is a former professional assassin who was hired by DINA for a series of murders. In 1978, a US court convicted him for his participation in the assassination of Orlando Letelier, former Chilean ambassador to the US, who was killed in 1976, when his car exploded in Washington, DC. Since his release from prison, Townley has been living in the US under the Witness Protection Program. Larios, a Chilean national, was also convicted of being “an accessory after the fact” in the Letelier assassination and is also living in the US, having struck a plea bargain with Washington. The third individual, Paz Romero, was sentenced to 12 years in prison in 1991, after admitting that he personally detonated the remote-controlled car bomb that killed Leteler. He was paroled after serving half of his sentence and was ordered to be deported to his home country of Cuba. However, due to the absence of a bilateral deportation agreement between Washington and Havana, Romero remained in the indefinite custody of the US Immigration and Naturalization Service. In 2001, the US Supreme Court ruled that indefinite detentions were unconstitutional, so Romero was released and has been living freely in the US since that time. Clapper revealed the hacking effort in a talk to a conference organized by the Bipartisan Policy Center, in Washington D.C.
NBC News quotes Clapper to say that the acts of espionage against the campaigns may only just be getting started. “As the campaigns intensify we’ll probably have more of it,” Clapper noted. The hackers breaking into the candidates’ networks include foreign governments seeking early information on policy thinking, or hackers with sabotage in mind. Clapper’s office recently released information about intrusions by foreign intelligence services into the campaigns for president back in 2008. Clapper’s office emphasized that the risk to the campaigns was real. “We’re aware that campaigns and related organizations and individuals are targeted by actors with a variety of motivations — from philosophical differences to espionage — and capabilities — from defacements to intrusions,” Clapper’s spokesman Brian Hale said in a statement. One hacking group not hiding its intentions is the cyber-anarchist group Anonymous, which has urged its supporters to attack the Web operations of Donald Trump. The National Intelligence Agency recently said that in 2008 it helped the two nominees — Barack Obama and John McCain — track and deal with cyber-intrusions during their campaigns for president. A document describing the extent of those operations was issued by Mr Clapper’s officer earlier this month. London (CNN) A former head of Britain's foreign intelligence agency MI6 has warned against a proposal for the European Union to offer visa-free travel for Turkish nationals in exchange for controlling migration into Europe, comparing it to "storing gasoline next to the fire." Richard Dearlove, who was head of Britain's Secret Intelligence Service, or MI6, from 1999 to 2004, made the comments Monday at an event for the BBC's World on the Move day, in which the British broadcaster focused its coverage on migration issues. 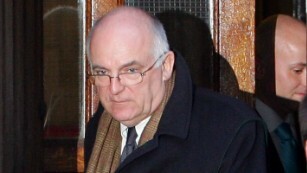 Richard Dearlove, the former head of Britain's Secret Intelligence Service. Speaking on how the migrant crisis has affected politics and security in Europe, he said that for the European Union "to offer visa-free access to 75 million Turks to stem the flow of migrants across the Aegean seems perverse, like storing gasoline next to the fire we're trying to extinguish." The promise of visa-free travel for Turks through the European Union has been floated as part of a deal between the 28-member bloc and Turkey to secure Ankara's help in stemming the flow of migrants passing through its territory and on into Europe. 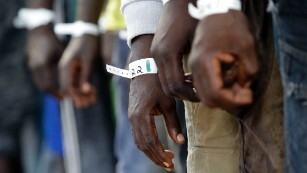 European leaders negotiated the deal in March to tackle the crisis, after more than a million irregular migrants, many fleeing violence in the Middle East and Afghanistan, entered Europe's borders last year. Under the terms of the so-called "one-for-one" deal, people who cross into Europe illegally are being sent back to Turkey, and for every Syrian sent back to Turkey, a vetted Syrian refugee will go from Turkey to be resettled in Europe. In return, the EU will give Turkey billions in funding to help it provide for the migrants within its borders, and grant various political concessions, including the right for Turks to travel through Europe without a visa. The proposal would see Turkey's 75 million citizens gain the right to enter the European Union's Schengen zone for up to 90 days at a time with biometric passports. But talks over the deal have stalled over Turkey's refusal to reform its anti-terror laws. Turkey has been trying to become a member of the EU since 1987, when it was still called the European Economic Community. Rather than granting visa-free travel to millions of Turks, Dearlove said that measures such as the EU's allocation of 1.8 billion euros to tackle the issues in Africa driving people to become migrants in Europe make "much more sense." "But this is not nearly enough money to embrace the vastness of the problem," he said. "How do you persuade the millions of people not to set out towards Europe in search of employment and a better life?" He said that "probably the only answer" is a "massive European response" akin to the Marshall Plan, in which the U.S. government spent billions to help rebuild shattered European economies after World War II. Also crucial is a "much more aggressive" maritime operation along the Libyan coastline. He described the European response to the migrant crisis as "hesitant and irresolute, complicated by the differing reaction of member states and the extent to which their national interests are affected." Russian soldiers stand guard in the ancient city of Palmyra in the central Homs province, Syria. BEIRUT – The Russian military is constructing a new army base in the central Syrian town of Palmyra, within the protected zone that holds the archaeological site listed by UNESCO as a world heritage site and without asking for permission from relevant authorities, an American heritage organization and a top Syrian archaeologist said Tuesday. The American School of Oriental Research's Cultural Heritage Initiative posted pictures from the satellite imagery and analytics company DigitalGlobe that show the construction on the edge of the ancient site that was damaged by the Islamic State group, which held Palmyra for 10 months. Russian demining experts have detonated hundreds of bombs left behind by the extremists at and near the site since the town was captured. A top Syrian archaeologist said the presence of Syrian and Russian troops in Palmyra is important to prevent ISIS from coming back. Maamoun Abdulkarim, head of the Antiquities and Museums Department in Damascus, told The Associated Press that the Russians are building small barracks that includes offices and clinics. Abdulkarim said his organization was not asked for permission but added that ISIS is close to the town and the presence of Russian and Syrian troops is important to ensure that the site remains in government hands. "We refuse to give permission even if it was for a small room to be built inside the site whether it is for the Syrian army, Russian army or anyone else," Abudlkarim said by telephone from Damascus. "We will never give such permission because this will be in violation of the archaeology law." Since Russia began launching airstrikes in Syria in September 2015, Moscow has tipped the balance of power in favor of President Bashar Assad's forces. Earlier this year Russia said it was scaling back its presence in Syria. Thomson ReutersRussian army sappers work at the historic part of Palmyra, Syria, in this handout photo released by Russian Ministry of Defence. Before ISIS captured the town in May 2015, the Syrian army was known to have minor military presence inside the site. During the Islamic State group's 10 months in Palmyra, the militants destroyed the Temple of Bel, which dated back to A.D. 32, the Temple of Baalshamin, which was several stories high and fronted by six towering columns, and the Arch of Triumph, which was built under the Roman emperor Septimius Severus between A.D. 193 and A.D. 211. "During the time of war, sometimes archaeological authorities don't have a say but security decisions dictate the orders," AbdulKarim said. "Once the situation improves and peace is reached, then we will openly call for removing" the barracks. Osama al-Khatib, a Syrian opposition activist from Palmyra who currently lives in Turkey, said the Russians are setting up prefabricated homes and tents on the northern edge of the archaeological site. He added that the site where the Russians are now based is hundreds of yards from the temples and the Arch of Triumph. He said there are also some historical graves near where the Russians are setting up their barracks. And one place the internet has been of particular help to ISIS is in recruitment, allowing the organization to scour for new supporters in all corners of the globe. This recruitment has even reached one place you might not expect: dating sites. A Jordanian intelligence official told BuzzFeed News that if a technology platform exists, ISIS has found a way to exploit it, and dating sites are no exception. This site wasn’t Tinder or OkCupid, but rather, a dating site for devout Muslims. A man reached out to the daughter, and tried to convince her to come to Raqqa, an ISIS stronghold. “He told her about the big house she would have and the servants,” the officer continued. “Her husband would be a handsome fighter … he even sent her photos of the beautiful jewelry he would buy her for her wedding night.” The daughter was stopped, but her story shows just how broad ISIS’ use of technology is. “Her case just shows you that even on dating sites ISIS is recruiting,” the official said. RS-28 Sarmat ICBM wheeling out of a bunker. Russia is testing an intercontinental ballistic missile that is so large and powerful it could hit any strategic target in the United States or NATO with independently targeted warheads possibly capable of penetrating ballistic missile defenses. According to a TASS report on May 6, Col.-Gen. Sergei Karakayev, commander of the Russian Strategic Missile Forces, said Russia will move their new RS-28 Sarmat intercontinental ballistic missiles to bases at Uzhurskogo and Dombarovsky. The first location is near Krasnoyarsk in Siberia; the second is located in the Urals in the Orenburg Oblast and is a major ICBM base first built by the Soviets during the 1960s. In particular, Dombarovsky is a site associated with missile training exercises. For example, in the early 2000s the SMF held as many as seven launches from the Dombarovsky site using decommissioned missiles that delivered commercial payloads. The bases also are ideal for launching the new missile toward targets either in the United States or in NATO countries such as Germany, France, or the United Kingdom once it becomes operational. In the report, Karakayev also said a “completed missile complex” will hold the Sarmat as a “silo-based heavy missile” intended to replace the venerable SS-18 ICBM. The Soviets first deployed the SS-18 in 1977 – the missile in its Cold War SS-18 MOD 4 configuration carried 10 multiple independently targeted reentry vehicles each with up to a 750 kiloton yield. An individual warhead had more than 20 times the destructive power of the Hiroshima bomb. It was specifically designed to attack and destroy American ICBM silos and other hardened targets. Code named Satan by NATO, the SS-18 MOD 6 version of the ICBM currently deployed by Russia has a single 20-megaton warhead. Russian sources say Sarmat will be operational by 2018. However, not much else is known about Sarmat. Various Russian reports indicate that it is a two-stage liquid-fuel missile with an estimated operational range of 6,200 miles weighing about 220,000 pounds and capable of hefting perhaps a dozen heavy warheads, each individually steerable during reentry. There is no information on the yield of each warhead. However, the hypersonic speed and increased maneuverability of the warheads apparently is an effort to thwart U.S. anti-ballistic missile systems. “From the very outset we kept saying that in the opinion of our experts the deployment of an anti-missile defense poses a threat to Russia,” Peskov said. Despite economic hardships and Western criticism, Russia has aggressively worked on improving its strategic missile inventory and the destructive power of its ICBMs. Recently, Russian Defense Minister Sergey Shoigu said revamping the nation’s strategic missile forces is a No. 1 priority. Last year, Gen. Valery Gerasimov, chief of the Russian Armed Forces general staff, said the United States and its NATO allies are developing the means to strike Russia precisely and effectively with strategic weapons. The Kremlin intends to introduce weapons that can penetrate the American missile defense shield and thwart this increased capability, Gerasimov said. The story even claimed that Sarmat’s warheads could wipe out territory equivalent to a landmass the size of Texas. A judge said Monday she’s inclined to believe the US government when it says a Vietnamese man plotted to carry out a suicide bombing of London’s Heathrow Airport. The statement by US District Judge Alison Nathan in Manhattan forced a postponement of the sentencing of Minh Quang Pham as his defence attorney requested more time to decide how best to change the judge’s mind. Which way the judge leans could be pivotal in determining whether Pham serves closer to the minimum 30 years in prison he faces or the 50 years in prison requested by prosecutors. Pham, 33, pleaded guilty in January to terrorism charges, admitting he provided material support in 2011 to al-Qaeda in the Arabian Peninsula. The group has called on followers to attack civilians and has taken credit for coordinating attacks overseas, including the January 2015 Paris attack on the French publication Charlie Hebdo, which killed a dozen people. Pham did not agree during his plea to government claims he plotted in 2011 to carry out a Heathrow attack, and no attack occurred. Pham’s attorney, Bobbi Sternheim, said Pham had “been firm since the day I met him” that it was never his intention to commit violence. She has represented him since he was extradited to the United States from London in March 2015. She said if he had planned to carry out the attack, he would have taken steps to do so in the nearly half-year from July 2011, when he returned to London from Yemen, to December 2011, when he was arrested. Sternheim said if he intended to bomb the airport his motivation would have been high after a US-born al-Qaeda leader, Anwar Al-Awlaki, was killed in a drone strike in Yemen in September 2011. “It didn’t happen,” she said. Prosecutors say Pham was directed by Al-Awlaki to detonate explosives made with household chemicals in the arrivals area at Heathrow. He was detained and questioned by authorities when he returned to England from Yemen, where he had received weapons training and worked on an al-Qaeda publicity publication since arriving there weeks after leaving his eight-months-pregnant wife behind in December 2010. The government has said he lied to his family about his travel destination. The judge said facts support the theory that Pham was careful after his return to London because he believed he was being watched by terrorism investigators. Assistant US Attorney Anna Skotko cited evidence to support the government’s claims, including statements he made to others that he was on track with his mission and that he wanted to be a martyr. “Jihad was more important than family,” she said. An appeals court in Seoul has upheld the conviction of a South Korean member of a spy cell that planned to assassinate the most senior North Korean defector to the South. The man, identified in media reports only by his last name, Park, is a South Korean citizen who allegedly helped a North Korean spy cell “based in China” plan the assassination of Hwang Jang-yop. In 1997, Hwang caused a sensation on both sides of the border when he defected to the South. A former secretary of the Korean Workers’ Party, Hwang was Pyongyang’s primary theorist and the ideological architect of juche, the philosophy of self-reliance, which is North Korea’s officially sanctioned state dogma. He was also believed to have ideologically mentored North Korean Supreme Leader Kim Jong-il, the father of the country’s current Supreme Leader, Kim Jong-un. Until his death from heart failure in April 2010, Hwang, had been living in the South with around-the-clock security protection. In October 2010, a few months before Hwang’s death, South Korean authorities revealed that two self-confessed North Korean spies, Tong Myong Kwan and Kim Myung Ho, had allegedly admitted to posing as defectors. Seoul said that Tong and Kim, who were both 36 at the time, were on an assassination mission assigned to them by the intelligence unit of the North Korean Ministry of Defense. The two reportedly stated under interrogation that they were selected for the mission in 2004 and were trained for six years in spy trade craft, as well as techniques of assimilating in life in South Korea, which apparently included “watching South Korean soap operas to gain a better understanding of South Korean society”. At the time of Tong and Kim’s arrest, South Korean authorities had stated that the two alleged North Korean spies had been assisted by at least two South Korean citizens. One has never been named. The other, Park, was indicted last year of providing logistical support to foreign spies who were plotting to kill Hwang, in return for ₩25 million ($21,000). His legal team appealed the sentence, saying he had been framed by the North Koreans. But on Tuesday, the Seoul High Court rejected the Park’s appeal and upheld his original 3-year jail sentence. A delivery driver from Luton has been jailed for life, with a minimum term of 12 years, for plotting to kill US personnel outside an air base. Junead Khan, 25, used his job to scout US bases for potential victims. He intended to stage a road accident outside the Lakenheath base and attack people who came to help, a court heard. Khan had also been found guilty, along with his uncle, Shazib Khan, 23, of preparing to go to Syria to join so-called Islamic State (IS). Shazib Khan, 23, was given a custodial sentence of eight years, with an extended period of five years on licence. Junead Khan also exchanged online messages with an IS fighter in Syria. Prosecutors claimed the man Khan exchanged messages with, who used the name Abu Hussain, was British-born Junaid Hussain. Hussain was killed in a US drone strike in the IS stronghold of Raqqa just weeks after his link with the planned UK attack was discovered. One message described an attack on military personnel, which they compared with the murder of Fusilier Lee Rigby in Woolwich in 2013. 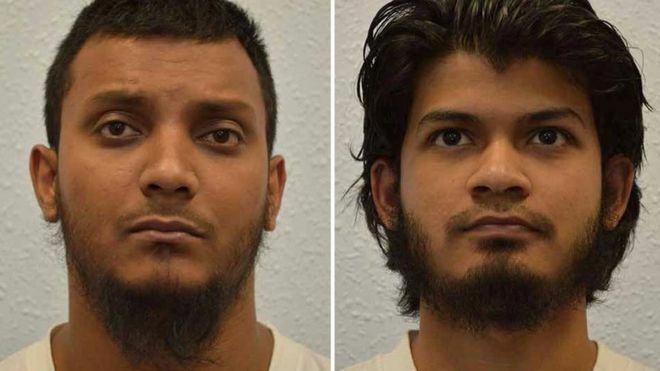 Sentencing Khan at London's Kingston Crown Court, Mr Justice Edis said: "Junead Khan was not far from the commission of the murder to be committed by horrifying method in the street in order to create terror and terrorist propaganda in this country. "His offence was so serious that a life sentence must be imposed." Police arrested Junead Khan last July and discovered pictures on his phone of him posing in his bedroom with an IS-style black flag later found in the attic. His computer was also found to contain an al-Qaeda bomb manual and Amazon searches for a large combat knife. Police officers had visited Khan as part of the national anti-extremism programme Prevent. But the court heard Khan mocked the programme in a series of scathing WhatsApp messages. Mr Justice Edis said the two men, who are of Bangladeshi backgrounds, had rejected the values and opportunities Britain gave them. He added: "They both believe that Sharia law is the only legitimate law and both reject democracy, because it involves law being made by people and not by God. "They have rejected the protection of the law of this country and education they have received by becoming committed supporters of Isis (IS) - an organisation which wishes to control the world and which will stop short of no barbarity in order to do so." Around 800 people will be involved in the role-play to test counter-terror tactics. Anti-terror police are to swoop on a shopping centre in a training exercise to test their response to a Paris or Brussels-type attack on civilians. Armed with machine guns, officers from the North West Counter Terrorism Unit will drill their training techniques and counter-terror tactics during the exercise at the huge intu Trafford Centre shopping complex on the outskirts of Manchester, starting at midnight on Monday. Around 800 people will be involved in the role-play exercise, including volunteers and fire and ambulance service personnel, with police wanting to make the “attack” as realistic as possible. The exercise will stretch over three days, involving a second location on Merseyside. Exact details have not been made public and are known only to a few senior officers, who will direct different scenarios such as possible hostage taking, mass casualties or suicide bombers, to test how the emergency services respond to “fluid” and developing situations. Police stress there is no specific threat to the shopping centre and the exercise has been planned since last December, but it will give them and businesses the opportunity to test their emergency terror response. The current UK terror threat level is described as severe, meaning an attack is highly likely, according to the security services. The exercise, codenamed Exercise Winchester Accord, is the fourth major exercise in recent months, coming after previous ones in London, Glasgow and Essex. The latest drill takes place while the shopping centre is closed to the public between midnight and 6am. Assistant Chief Constable Rebekah Sutcliffe of Greater Manchester Police said: “This exercise is part of a national programme that has been planned extensively for five months. 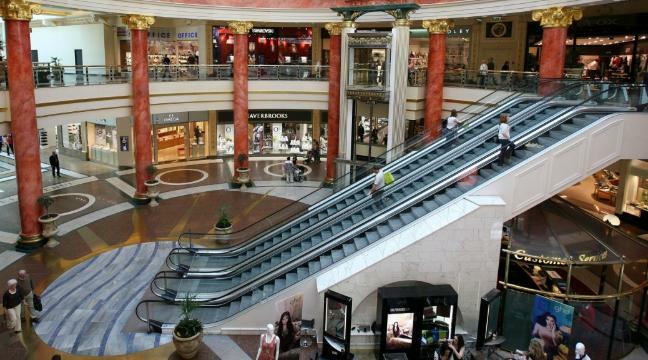 “We have worked closely with intu Trafford Centre and other emergency services to test our response to a major terrorist incident in a public place, which for part of this exercise is a shopping centre. “Residents in the area may hear loud noises and see emergency services activity around intu Trafford Centre during the exercise and I can reassure people that there is no cause for concern. Any suspicious activity or behaviour can be reported to police via the confidential Anti-Terrorist Hotline by calling 0800 789 321 FREE. Extremist or terrorist content online can be reported at www.gov.uk/report-terrorism.